Europe’s truck operators to gather in Brussels to discuss the factors impacting their fuel bills. As fuel prices rise, Europe’s truck fleets are calling out for more information to achieve significant reductions in their fuel consumption, according to new research from Goodyear Dunlop Tires Europe. Perhaps unsurprisingly, fleet operators are almost universally (92%) taking steps to improve their fuel efficiency. However, despite these efforts, Europe’s fleet operators believe much more could be done. Nearly a third (28%) say they could achieve greater fuel savings if they were better informed on which factors will have the greatest impact on their truck’s fuel consumption. This lack of information means many fleet managers remain unsure about the future. Almost one in six (15%) worry they will not be able to remain profitable over the coming decade, and a fifth (19%) of fleets are not confident they will be able to make any further improvements to their fuel efficiency in this same time frame. 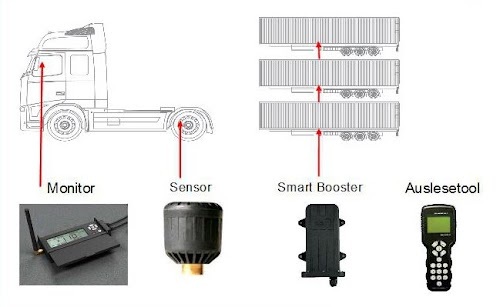 Tyre Pressure Monitoring Systems for trucks and buses will not only bring the operator massive advantages: they are also proven to reduce petrol consumption by about 5% and tyre tread wear by up to 40% which in turn helps protect the environment and reduces wear on our roads.